High-vis safety vests are essential for directing traffic, working in low-light environments, or taking on other potentially risky tasks. To meet the needs of hardworking professionals, D.E. Gemmill Inc. carries a large selection of products that balance comfort and superior visibility, meeting ANSI Class 2 or Class 3 standards. Browse our inventory above and place your order today. 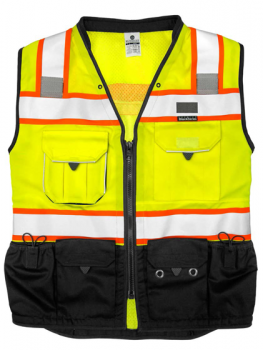 In addition to traffic vests, we also sell high-vis pants, shirts, jackets, and more — everything you need for comprehensive safety on the job. We are dedicated safety experts with longstanding partnerships with some of today’s most trusted manufacturers of personal protective equipment. The main advantage of our safety vests is increased visibility when working in dangerous conditions. With a high-visibility reflective safety vest, oncoming traffic and other workers can see you clearly from farther away, even in low light. For this reason alone, safety vests are essential for roadwork crews, crossing guards, traffic officers, airport workers, and many others. Safety vests offer superior maneuverability when working near equipment that could potentially be hazardous when wearing long sleeves. Another benefit of safety vests is that they are easy to remove, making it simple to switch from one job site to another. Multiple pockets for convenient storage of tools, pens, phones, etc. And more. Browse our individual products for detailed specifications, class ratings, and application information. We also offer a full selection of women’s safety vests online to ensure that best fit and utmost safety for your workers while on the job. If you can’t find what you’re looking for online, please contact D.E. Gemmill Inc. directly. There’s a good chance our team can source a specialty product from one of our suppliers or recommend a suitable alternative. Why Buy Class 2 and Class 3 Safety Vests? A safety vest’s ANSI class rating is the most critical distinction when buying protective equipment. Different class vests are suitable for different applications. Class 1 is generally reserved for the least dangerous environments, such as residential streets with speed limits below 25 mph. Class 2 vests feature more reflective striping and a larger safety yellow or safety orange background. As a result, they offer better visibility and increased protection in job sites near faster-moving traffic. Class 3 vests offer the most protection and are ideal for nightime reflectivity and highway roadwork where oncoming traffic is consistent. If you’re unsure which type of vest is appropriate for your application, please get in touch with D.E. Gemmill Inc. directly. Our experts would be happy to recommend the right product for your needs. The D.E. Gemmill Inc. online store is the best place to buy high-visibility reflective vests online. When you buy your safety vests online, you’ll enjoy fast shipping and a customer-satisfaction guarantee return policy. However, if you’re in the York, PA, area, consider stopping by our retail store to try out a potential purchase before making a decision. We’re located at 85 N Belmont Street, and we also offer mobile safety equipment sales to job sites within a 150-mile radius. See for yourself why we’re the undisputed safety leaders by getting in touch with us or ordering your products — online or in person — today!